Hope I haven't mentioned these before. The better break up efforts I recall occurred during my first job, at KTUL Radio. To refresh my memory, I had written down some episodes for a never-to-be published book. In 1959, when the station was temporarily located in Turley, bloopers were aided and abetted by a building not particularly suited for radio. It was too small and no rooms were soundproofed. Open a mic and Bob Gregory's booming voice, recording commercials in the adjacent studio, was often heard in your headset going out over-the-air. A couple of years later, when the station was sold, pending FCC approval that took several months, the staff developed a collective "we don't give a sh*t" attitude. Laughter helped break the tension, much like the warden cracking a joke while escorting an inmate to the electric chair. It would be my first exposure to some rather creative efforts to make newscasters "break up" on-the-air. An effective method was the use of the intercom. The two-way system was normally reserved for off-air talk between newscaster and control room jock, usually during commercials. The main culprits included Gregory, Gary Chew and Les Parsons. Suddenly, in the middle of a newscast, a control room voice would observe: "You're doing a great job, man." Sometimes it was: "wrap it up, you're running long." The intercom chatter worked like a charm, especially on Gregory who would cut his microphone for ten or fifteen seconds while unsuccessfully attempting, to stifle his booming laughter. Once, while I was reading a newscast, someone opened the back door leading to the cow pasture and carried in a lawn sprinkler placing it on the desk beside my news copy. After the troublemaker departed, the sprinkler started up, drenching me for two or three minutes while I tried to read the news with Cronkite-like authority. Unfortunately, that's the way it was...in Turley. Truly devilish pranks never failed to accomplish their goal. The control room contained several large, heavy turntables. Sitting on top, only a culprits head was visible through the glass window into the newsroom. While reading the news, the sight of someones head revolving slowing (Exorcist-style,) is unnerving, to say the least. There were a couple more memorable breakups I may submit later. Ken Reed and a couple of other guys decided that extreme measures had to be taken, so, with the curtains to the studio closed, they proceeded to undress Creager while he talked. They got him down to the buff, but he didn't miss a line of his copy. He got redder than usual in the face, but that was the only change. Finally, and I think Ken was the perpetrator, the CO2 fire extinguisher that hung in the hall was brought into play. The horn was placed against Creager's bare backside and the trigger was pulled. Creager didn't laugh, at least I don't think he did, because he leaped forward, knocking over the microphone, and the board quickly went to a commercial. One I didn't see, but which Noel Confer can tell you about, involved a coke bottle half-filled with water, an Alka-Seltzer tablet, and a condom. It's a classic. Comments: Believe if or not, I just finished a box of AQ fried chicken, delivered fresh from Springdale this p.m. Larrupin' good. It comes highly recommended. Outside of going to Eureka Springs, I only pass through Arkansas on the way to New Orleans, Memphis or Nashville. I try not to stop and eat, or be eaten. Location: Sand Springs, waiting to become a STAR! Comments: Mike... Re: Western Arkansas Dining experiences. I know it's not Ft. Smith, but for a short trip, you can't beat the AQ Chicken House in Springdale! My wife and I take a trip there at least once a month to get some of the best cast iron pan fried chicken this side of Heaven! And the beer battered fries! O lordy...!! Duke Baul - no idea. John Heatley - at last word was a gunsmith in Tulsey. Try Jimmy Reid's or Sonny Hollingshead's remembrances in the previous guestbooks. Can anyone tell me - if is it true that Wayne "Tuffy" Johnson has retired from 8 to tend his goats? Has anyone crossed tracks with former KTUL/CBS Hollywood cameraman Toby Brown in retirement at Lake Tenkiller? Comments: Leave us not forget - Jerry Lewis as visiting lecturer at ORU in the late 70's. Often wish we had someone here that took his "Master Class" - drop us a line. Mike Miller alert - if he doesn't kill me for noting this on-line - Mike Miller and wife may soon be residents of Ft.Smith, AR - if all goes well...anyone with Western Arkansas cuisine experiences have any Ft.Smith dining suggestions for the Millers? I'll miss the BBQ or chili lunches with Mike up in DC. Hey - that might make Mike available for any TTM Casa Bonita bashes in the future! BTW - as he moves South, I am moving back to DC at the end of September...my summer vacation relief job - which started with MERN TV to Iraq in May and expanded - has brought the folks in DC to put me on staff as a tech. I am kinda doing this TV career thang sideways - tech to director to manager back to tech, but it beats workin' at WalMart! I am bucking the trend for UNemployment, for now. Comments: Many months ago I entered several examples of how people were made to break-up on mike, particularly at KTUL and KRMG, but I never saw or heard of Doc Hull, himself, ever breaking up. He always seemed to be under control. Comments: Santa brought me a clown marionette from Brewster's when I was ten. I climbed up on a chair to operate it, the chair toppled, and the clown was crushed. Typical life span of a Christmas toy - 10 minutes. Later, Mom and Dad replaced it with a cheaper model from the same toy store. I remember Gary Lewis hanging around Tulsa back when Mazeppa was on the air. Gary and his band, Medicine, appeared on the UFFCM. When I heard Gary sing a few years ago at the State Fair, he did a very good job. He looked and sounded very young. Several times, he mentioned how much he enjoyed living in Tulsa back in the seventies. My clan thought that Beef Baloney rang the bell with the "Hungry Hippo" bit. I think their effort in putting on the show earns an "A Plus". Comments: Just found this site and have been sitting here for hours remembering the good ole days at KTUL. I miss being behind the camera and doing all those sporting events. I see Jimmy Reid is still around. But what happened to some of the other guys like Willie Smith, Duke, Heatley, Henry (Henri') I know Terri Clark was at CBS in Hollywood for sometime? Anyway, good to be able to go home now and then. Leon Russell was his producer and played several of the instruments on his hit songs. Tulsan Tommy Tripplehorn (Jeanne's dad) was his guitarist. Comments: Speaking of breaking up. One evening, probably in 1958, when I was reporting the news on KRMG, in the booth all KRMGers know so well, Doc Hull quietly opened the door and whispered, very seriously, "I've got to go pee." No listener could have heard it, but I did. It was so off the wall that I broke up, laughing out of control. It's always struck me as kinda peculiar that radio and TV people are the only folks I know who mess with each other's jobs like that. Comments: Can someone enlighten me on the Gary Lewis/Tulsa connection? I saw GL on the Jerry Lewis Telethon today and I vaguely remembered hearing once there was a T-town connection but I haven't the foggiest what it was. Gary looked pretty darn good by the way -- his dad said Gary was 58 years old, which is pretty hard to believe. Jerry is apparently 77 or so. Did maybe Leon play on the old GL & The Playboys hit records? Here's a page with info about Leon Russell's participation on "This Diamond Ring". Speaking of the telethon, seeing Steve Lawrence on it reminded me again of the fantastic Steve and Eydie version of grunge band Soundgarden's "Black Hole Sun". The MP3 can be downloaded on this page under "Bizarre Covers". Here's how S & E came to record the song. Comments: I just remembered something the KTUL staffer used to do to break up announcers (told to me by Nancy Greaves). They would gather up soap flakes which had had moisture get into them, forming large pellets. Arranging them on a huge card, they would then show the hapless new announcer this pile with the words, "Polar Bear Sh*t" printed beneath them. Worked every time. Comments: Have just read through some of the older archived comments and stories. Wonderful stuff! In 1953-54 Nancy Greaves and I lived catty-corner across the street from the Quaker Drug store. I worked downtown at an oil company and Nancy worked at the radio station on the park. Due to lack of bus fare, I often walked home in 3" heels, but she could walk home for lunch. She had a degree from TU in radio/TV and I had dropped out of school for a year. Wayne Maxwell, also an alum of TU's theater dept, lived right next door with his parents. My mother would not set foot over our threshold since living in an apartment was not ladylike in her view. (She did bring us squash and tomatoes from my parents' garden in Brookside and leave them in a basket by our door). Wayne, a friend, could and did stand on his toilet and look into our bedroom and living room windows - then would call and tell us what we were wearing. (Fortunately, mother did not know about this). Neither Nancy nor I had a clue about housekeeping and had a tiny apartment refrigerator with two small spaces for ice cube trays. One of our several suitors brought us a whole fish, which we froze without benefit of tray in one of the compartments. We then could not dislodge it; it stayed there for the entire year we were in residence. We found that we could hear what the older, single man, who lived immediately above us in an identical apartment, was saying in his kitchen if we stood on a plastic table mat on top of the two-burner stove top in our kitchen. Amidst muffled giggling in that tiny, tiny space, we regularly eavesdropped. Once, I remember, he said heatedly to a visiting friend, ice cubes tinkling in his glass, "You just can't categorize women! They won't stay in their categories". Not too long after that, he had a large party on New Year's Eve with a conga line which at about 2 a.m. wound down the stairs and out the front door onto the street. For that, we stood on chairs and peered out our opened front door transom. Fascinating times in Tulsa! One of my favorite things was that as I walked home down Boston, I think, there was a small decorator's shop. In the window for several months was a hand-painted toilet seat with a poodle and rhinestones on the top of it. In rosy red cursive writing on the underside of the bottom part of the seat, it read, "Goodie, Goodie, Daddy's Home". I coveted it. Just think what it would bring on eBay now! Frank Morrow has mentioned Quaker Drug on 18th Street and KTUL at "Boulder on the Park" (where he worked for three years) on several occasions. Take a look at this page from Frank, Lost Cultural Aspects of the '50's Generation in Tulsa. Thanks for the great slice of Tulsa in the early 50s, Mary Lou. 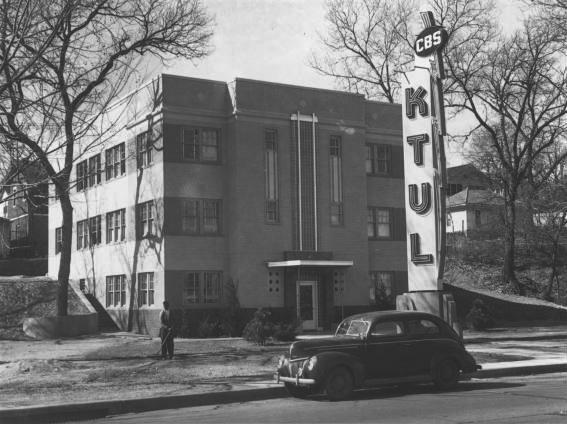 KTUL Radio, 1938, at Boulder on the Park (now called Veterans Park), 1900 S Boulder. Comments: Jim Stunkard and Terry Phipps started an demi-empire in Tulsa - with good hands, good people and a mastery of early portable tv technology. They started small and went large. Glad to see Jim Stunkard still kickin'....Need to get his former employee, Beau Anello here, too, as our "cast of characters", too. Y'all don't do no laborin' this holiday weekend! Comments: For what it's worth, the building subbing for a DX station in The Outsiders is still standing at the 'corner' of E. Main St. and Cincinnati in Sperry. Comments: Discovered this site only today and found myself on the missing list. It is good to be missing and missed. After KTUL, KOTV, KTEW (KJRH), FISHING WITH ROLAND MARTIN (syndicated in 125 markets), KJRH again, KTUL again, GREAT PORTS OF AMERICA (PBS), KOKI, WXXV, and the FOX station in Tyler, Texas I decided that was quite enough. And it was. Comments: Hey, I remember Sam Lane! Funny how I remember his name from when he was at Channel 2, but I really remember his face from Fox23. Also, I was on the BA yesterday when a memory neuron fired. Does anyone else remember KRMG having a billboard on the BA near Memorial that had lights to indicate what you could hear on KRMG at that moment (News, Weather, or Traffic)? I remember turning the radio to KRMG when I passed it to see if the billboard was accurate. In Guestbook 19 (also the Other kiddie shows page...webmaster), I read that you were part of the floor crew when Mary Susan Gifford ("Miss Nancy") was the first "Romper Room" teacher at KTUL in Tulsa. I assume you were there when Life Magazine photographers were there doing an article for a September 1956 issue with film star Janet Blair on the cover. Do you know if Sue is still living? I remember that her husband's name was Joe. If anyone knows Nate's whereabouts or his email address, let him know about Marlyn's note. 9/3/2003: Take a look at the new Romper Room in Tulsa page. Comments: Just wanted to give a shout from Panama City, Florida. I worked as a meteorologist for KJRH-TV from 1992-1996. I then returned to Tulsa to work for KOKI-Fox23 in 1999. I am now in Panama City, Florida but am wanting to come back home to T-town. Florida is not all that it's cracked up to be. Have lots of good memories of Tulsa when I was growing up and when I was on the air there. Comments: Back when Count Gregore (John Ferguson) was on Channel 4 in the 1970s, we used to do a stunt on his show where the movie would freeze-frame, then the Count would walk into the picture and make some comment about the film's plot, talk to the actors, etc. Then we'd fade to black and go to commercial. Comments: Ben is talking my language, so please pardon me if I go on a non-Tulsa TV-related tangent. Tall Paul Insurance. I remember it well. The commercials were of some very early bad claymation character who was a sheriff or something. The theme song is burned into my memory, as is the phone number: 524-1541. The guy on channel 25's news breaks (NewsTouch 25) is Ronnie Kaye, longtime OKC radio personality who is back at it doing afternoons on KOMA. Count Gregor was not to be missed. The movies were horrifyingly horrible, but it was fun. Interestingly, the guy who played Count Gregor did (still does?) some local Hair Club For Men commercials. He did Count Gregor as recently as '96. And I as well would like to congratulate the Talons on winning the ArenaCup. I missed the game, but I understand the Convention Center was rockin' Saturday night. Comments: Was formatting History Channel shows for breaks tonight for re-air on Orbit TV to the MidEast. 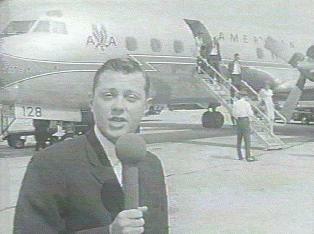 On one show - former KTUL reporter/American Airlines p.r. 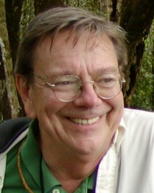 flack, Bob Leder, was credited at show's end. He is now (or was in 2001 when the show was produced..) Bell Helicopter Textron div. Communications Manager. Incidently - the "FLY PAST" series on A&E/History Channel is produced, directed and narrated by former TV actor - Monte Markham. Several of his family members also worked on the series for Perpetual Motion Productions. BTW besides being on BayWatch for years - he had the forgettable role of the only OTHER actor to play Perry Mason on TV in '73 for a year - before Raymond Burr resumed the role in made for TV movies. Location: In the glow of the Cup. Comments: My friends, this doesn't have a lot to do with Tulsa TV memories or anything, but the Talons won the ArenaCup tonight and I just wanted to give them a shout out. I never even thought about a trailer existing for WEEKEND! It makes the film look so much more exciting than it really is! They left out the part where a worker is eating a sandwich for 5 minutes as Marxist dialogues make up the soundtrack. It has some breathtaking sections that fans of abstract cinema would like, but other parts are so dull that they feel like an eternity. It's ultimately long and boring. I would highly recommend it to Maoist post-structuralists. I saw it in a class (that I wasn't taking) at TU in 1983. Those are just a few of the things I remember from Oklahoma television. Hopefully a few people remember these along with me. Comments: I recall Brewster's in the 1950s as being an upscale "hobby shop" rather than a mere toy store. Sure, he had Lionel electric trains but he also sold HO gauge miniatures. And real balsa wood for carving model planes, and tiny bottles of enamel paint. I sorta remember Mr. Brewster as a moderately heavyset fellow with black horn-rimmed glasses. His place was directly across from the cemetery. It's really weird how the memory works, I recall a prominent tombstone directly across Peoria from Brewster's with the name "Hodge" on it. Is it still there? Comments: Does anyone have memories of Brewsters Toy store and his TV show? It featured cartoons and giving toys to the kids who were on his show. I even think the show was broadcast from his store. Know anything about Edie Washburn or Artie Washburn? I see they have been mentioned by Mr Morrow. My brother knew them way back when, and was interested in their whereabouts. I wish we had more about Brewster's. What we do have is a virtual Brewster's Toys with webmaster-created, TV-related Java toys for your amusement. There is a bit of info about Brewster's on the Oom-A-Gog page. Comments: LEE ROBERTS is at KRXO 107.1 in OKC. Go to KRXO.COM. Comments: Again, I find myself spending way too much time reading about all those familiar Tulsa media folks that we haven't heard from in a while. I was just reading an old entry from my good buddy Charlie Derek. A couple years ago he e-mailed me from Dallas where he was doing a syndicated show for ABC Radio after having spent a few years in Florida. He told me he'd just been to a Rangers game with Gary Reynolds. Small world! I logged onto this site to see if anyone knew anything about the whereabouts of Lee Roberts? He was the original over-night jock when KVOO-FM went on the air back in '87. He left about a year later for a position at a rock station in OKC, I believe. Haven't heard a thing about him since. Also, just this past weekend, KVOO's former morning man, Andy "O", had a get-together at his house of former KVOO-ites. Saw several former office staff, Shirley Speechley, Amber & Kathleen, former PD-Rick Alan West, Heather Miles and Robin Carpenter(both are still with KVOO,) Brett Thompson-or "Danger Boy," a couple former AE's-Karen & Linda, and former news reporters Amy Marks and Glenn Schroeder. With all of the bad news from around the world recently, it was heartwarming to see many good friends and talk about the good ol' days. I think it speaks volumes about Andy & Michelle's character that they've been able to keep in touch with so many former co-workers. It was truly an honor to have had the opportunity to work with such wonderful people. I spotted Charlene introducing Jerry Lee Lewis a couple of weekends ago at the Greenwood Jazz(?) Festival. That's odd, because my Yahoo mailbox was about 58% full, and I have been maxed out to 117% both days due to the virus. Is that as much as Yahoo will allow once you are past 100%? For me, that amounts to 1 extra meg beyond my alloted amount. This can happen to you if you are in the address books of lots of folks who have the virus in their computers. Comments: Just been having some giggles and doing some reminiscing thanks to Lowell Burch's CD "Glued to the Tube." Highly recommend it to aficionados of Tulsa memories. (The above entry is authentic.) Lowell and his wife Susan wrote, produced and performed this CD of original songs about local TV heroes. Check their web site for more info. It has been featured on the TTM Bulletin Board since late July. The Tastee-Freeze was on North Cincinnati around 33rd St. North...this is where 'Dallas' took them to get something to eat after they had been in the church. The building was still there a few years ago with junk cars and a fence surrounding it...I do not know if it still stands or not. Comments: The previous Guestbook began with the weather, including some entertaining Tulsa tornado stories from Erick, Mike Miller, Jim Hartz and others. Then it turned to the news: the big power outage in the Northeast and the Airgas plant explosion on North Peoria here in Tulsa. Amazingly, no one was hurt in either event. There was residual discussion of the local "Queer Eye" preemption. We saw Mary Kay Place at T.U. in 1966. We may have seen Gary Busey in a 1970 Gremlin commercial (but I don't think so). We ended with questions from the webmaster of a site about "The Outsiders" (film and book) re shooting locations in Tulsa. Several answers were found in previous Guestbooks. It's all yours for the reading in Guestbook 144.